Is BofI Holding, Inc. (BOFI) A Good Stock To Buy? It seems that the masses and most of the financial media hate hedge funds and what they do, but why is this hatred of hedge funds so prominent? At the end of the day, these asset management firms do not gamble the hard-earned money of the people who are on the edge of poverty. Truth be told, most hedge fund managers and other smaller players within this industry are very smart and skilled investors. Of course, they may also make wrong bets in some instances, but no one knows what the future holds and how market participants will react to the bountiful news that floods in each day. The S&P 500 Index gained 7.6% in the 12 month-period that ended November 21, while less than 49% of its stocks beat the benchmark. In contrast, the 30 most popular mid-cap stocks among the top hedge fund investors tracked by the Insider Monkey team returned 18% over the same period, which provides evidence that these money managers do have great stock picking abilities. That’s why we believe it isn’t a waste of time to check out hedge fund sentiment before you invest in a stock like BofI Holding, Inc. (NASDAQ:BOFI). Is BofI Holding, Inc. (NASDAQ:BOFI) the right pick for your portfolio? Hedge funds seem to be getting more optimistic. The number of long hedge fund bets that are revealed through the 13F filings improved by one during the third quarter. There were 18 funds in our database with BOFI positions at the end of September. The level and the change in hedge fund popularity aren’t the only variables you need to analyze to decipher hedge funds’ perspectives. A stock may witness a boost in popularity but it may still be less popular than similarly priced stocks. 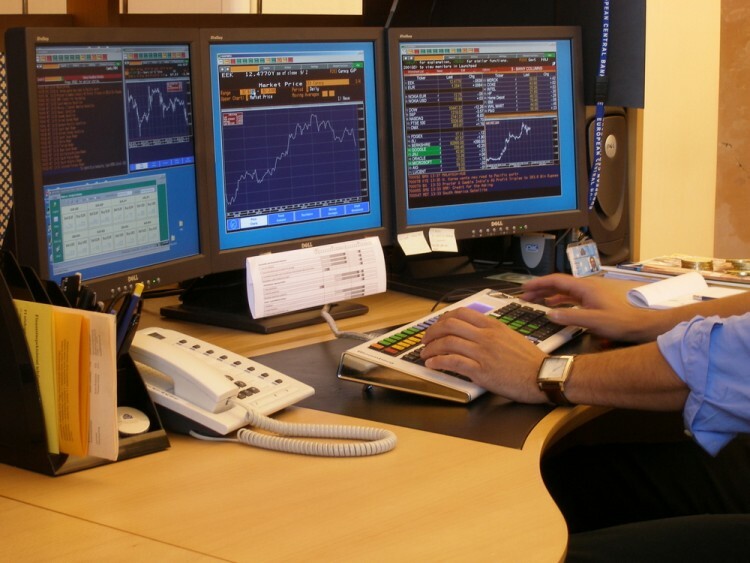 That’s why at the end of this article we will examine companies such as NBT Bancorp Inc. (NASDAQ:NBTB), Renasant Corp. (NASDAQ:RNST), and First Interstate Bancsystem Inc (NASDAQ:FIBK) to gather more data points. Now, we’re going to analyze the key action regarding BofI Holding, Inc. (NASDAQ:BOFI). How have hedgies been trading BofI Holding, Inc. (NASDAQ:BOFI)? Heading into the fourth quarter of 2016, a total of 18 of the hedge funds tracked by Insider Monkey were bullish on BofI Holding, Inc. (NASDAQ:BOFI), up by 6% over the quarter. 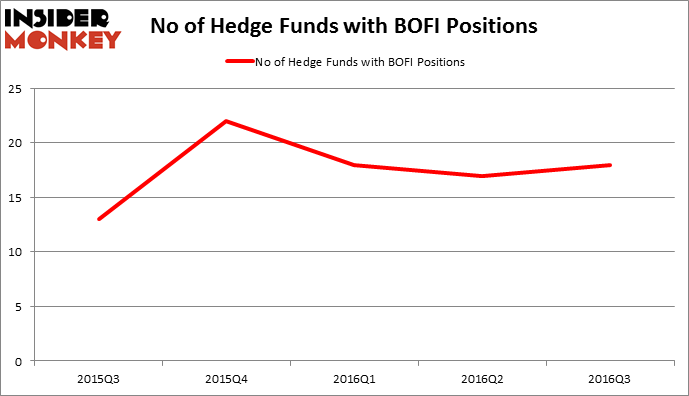 The graph below displays the number of hedge funds with bullish position in BOFI over the last 5 quarters. So, let’s review which hedge funds were among the top holders of the stock and which hedge funds were making big moves. According to publicly available hedge fund and institutional investor holdings data compiled by Insider Monkey, John Thiessen’s Vertex One Asset Management holds the biggest position in BofI Holding, Inc. (NASDAQ:BOFI). Vertex One Asset Management has a $27.6 million position in the stock, comprising 4.4% of its 13F portfolio. Coming in second is Weatherbie Capital, led by Matthew A. Weatherbie, holding a $22.7 million position; 2.9% of its 13F portfolio is allocated to the stock. Other peers that hold long positions include Matthew Lindenbaum’s Basswood Capital, Chuck Royce’s Royce & Associates, and Anand Parekh’s Alyeska Investment Group. We should note that none of these hedge funds are among our list of the 100 best performing hedge funds which is based on the performance of their 13F long positions in non-microcap stocks. Hedge Funds Are Still Buying Novanta Inc (USA) (NOVT) Is Liberty Sirius XM Group (LSXMK) A Good Stock To Buy? Is Northstar Realty Europe Corp (NRE) Going to Burn These Hedge Funds? Hedge Funds Don’t Think Very Highly of Annaly Capital Management, Inc... Is Nordic American Tanker Ltd (NAT) A Good Stock to Buy? Should You Avoid Nationstar Mortgage Holdings Inc (NSM)?